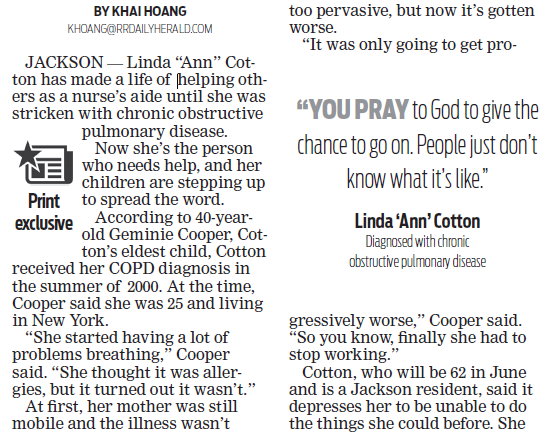 Linda “Ann” Cotton will be turning 62 years old in June. However, she is very ill. A double lung transplant is her only hope for survival and a solid quality of life after years of struggling with COPD and Emphysema. Ann, who is one of the kindest people you’d ever hope to meet, needs our help, because the cost of a transplant is overwhelming. Ann grew up in Jackson, NC and graduated from Northampton County High School East. She went on to Fayetteville State University for a short time before relocating to New York City. 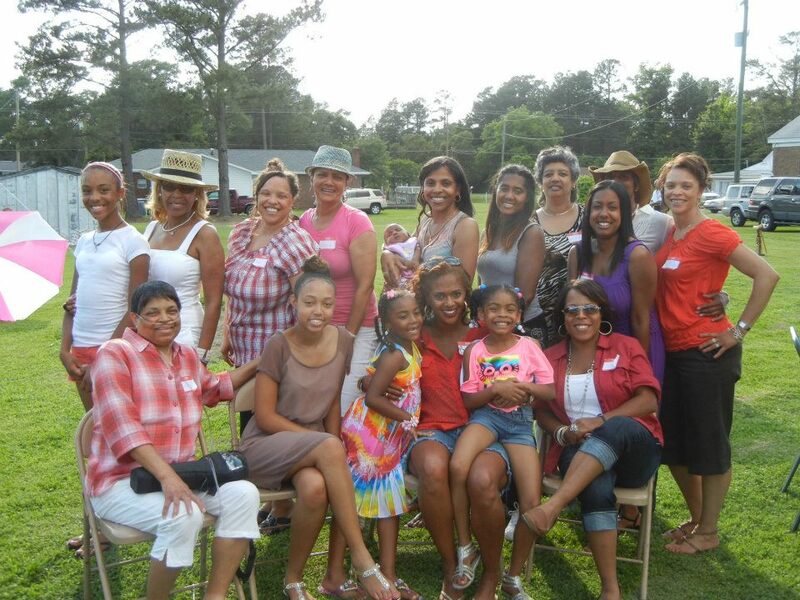 After spending many years in New York, she came back home to North Carolina to raise her family. Ann became a Nurse’s Aide, a job that she loved because she has a heart for people. She is always willing and able to take care of anyone in need, never looking for anything in return. She continued to do the work that she loves until her illness forced her to leave. Now after many years of helping others, Ann is the one who needs our help. Ann’s four children, Geminie “GJ”, Brandon, Cordero, and Crystal, her family, and friends are committed to seeing her through this transplant. Transplants are life-saving but emotionally and financially draining. Even with insurance, Ann is facing very high expenses including relocating for six months to be closer to UNC Chapel Hill Hospital, post-transplant medications of up to $1,200 a month and co-pays, lab fees and more. To help with the financial burden of Ann’s uninsured expenses, a fundraising campaign in her honor has been established with HelpHOPELive, a trusted nonprofit organization that has been providing community-based fundraising guidance to patients and their families for more than 30 years. All donations are tax-deductible, are held by HelpHOPELive in the Southeast Lung Transplant Fund, and are administered by HelpHOPELive for transplant-related expenses only. Please consider a contribution. For credit care contributions, please click the Donate Now button. Thank you for your prayers, support and generosity. Keep an eye on the website because we will be keeping you up to date on her progress. A Good News Update — We are pleased to share our news that Ann received her Gift of Life – her double lung transplant – on Tuesday, September 22. Thank you for your support of our continued need to fundraise. 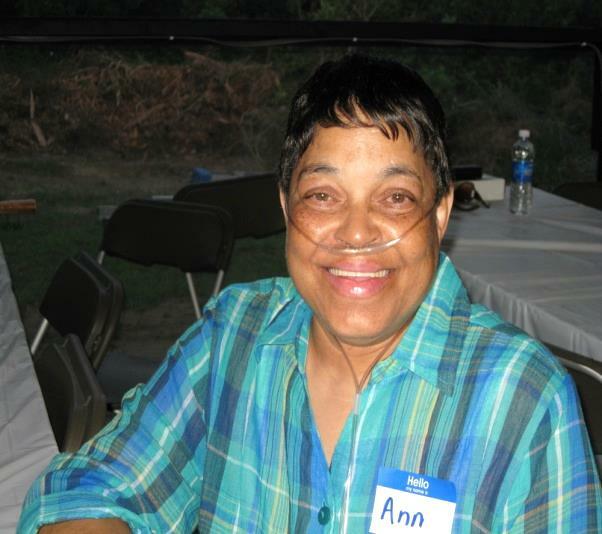 As of today, Tuesday, June 30, 2105, Linda “Ann” has been officially listed as a lung transplant candidate at UNC Chapel Hill Hospital. Let’s keep praying for her and keep fundraising efforts moving to help her. As of today, Tuesday, June 30, 2015, Linda has been officially listed as a lung transplant candidate at UNC Chapel Hill!!!!! Please continue to pray for her and continue to spread the word since fundraising is extremely important during and after this process.